Vijay Rana, the editor of NRIfm.com, argues in this lecture that Gandhi has been the central figure in the thoughts and ideas of leaders like Dr Martin Luther King, Nelson Mandela, Dalai Lama and Aung San Suu Kyi, leaders whose politics has always been possessed by morality and idealism.. He also cites examples from his book: ‘Mahatma Gandhi: Ideas and Images for Non-violence’, how various visual representations of Mahatma Gandhi are being used to promote his ideas around the world. 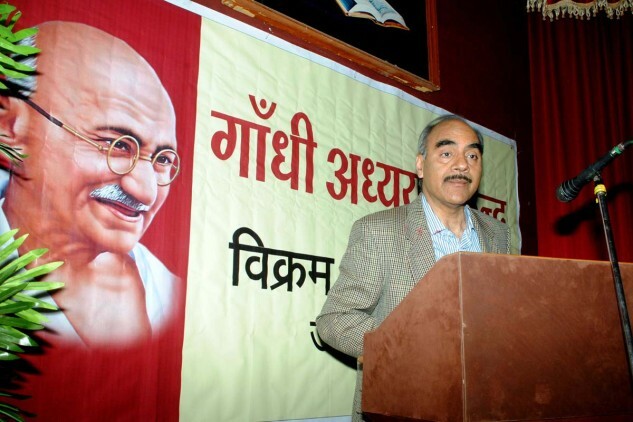 The lecture was organised by the Gandhi Studies Centre , Vikramshila University, Ujjain. The event was conducted by Dr Gopal Sharma, the head of the centre and was presided over by Dr Jawaharlal Kaul, the Vice Chancellor of Vikramshila University.